Pamper your face with this cleansing and moisturizing set! The honey soap will gently cleanse your face. The under-eye serum helps moisturize that tender area under the eyes while the cream moisturizes the entire face and neck area. SOAP: To microwave-safe measuring cup, add 14.7 oz. cut up Honey Soap Base. Heat in microwave until completely melted. Add 5 ml Lemongrass Green Tea Fragrance and stir. Place the plastic soap mold on a cookie sheet. Fill mold cavities with melted soap. Spritz the top of soap with rubbing alcohol to break up any air bubbles on the surface. Let soap sit for 10 minutes then place in freezer for 30 minutes to set up. Remove from freezer and let sit at room temperature for 10 minutes. Then turn mold over and carefully remove soap from each cavity. Set these aside. Repeat above steps twice to make the remaining 8 bars of soap. CREAM: To a large mixing bowl, add soy butter blend. Add 0.50 oz. vitamin E, 0.50 oz. meadowfoam seed oil, 0.50 oz. sweet almond oil and 0.50 oz. castor oil. Using a hand mixer, gently blend oils into butter blend. Add 1.5 oz. Slick Fix and 10 ml fragrance oil and blend in. Fill each jar with 3 oz. by weight then apply lids. UNDER-EYE SERUM: To the Mix & Pour Funnel Pitcher add 1.5 oz. vitamin E, 1.5 oz. meadowfoam seed oil, 1.5 oz. 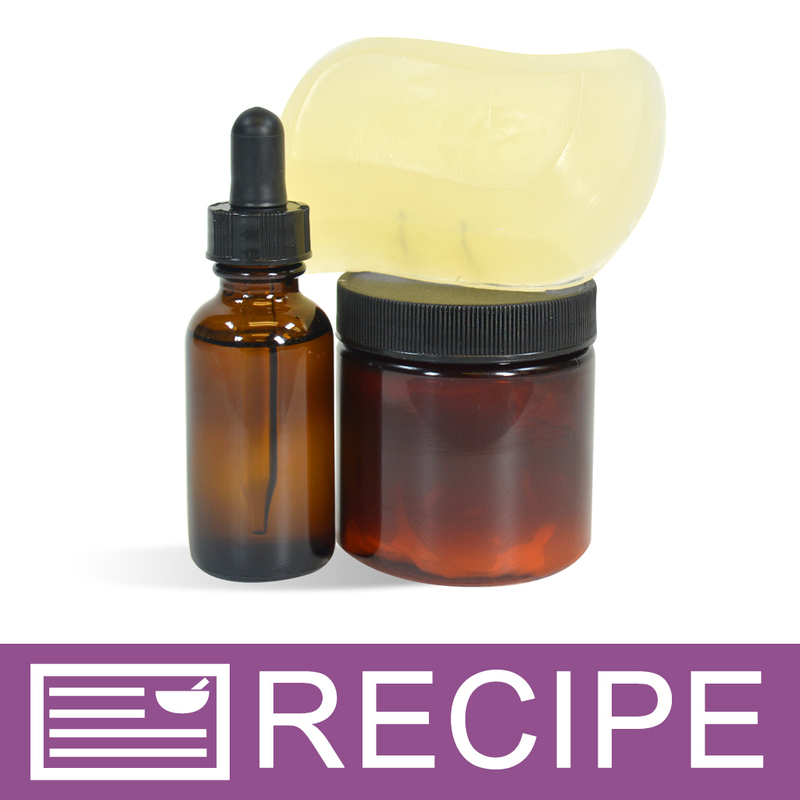 sweet almond oil, 1.5 oz. apricot kernel oil and 6 oz. castor oil. Fill each glass bottle to 1 ounce by weight. Apply droppers. To package, place one of each product into a cello bag and tie with raffia or ribbon of choice. To Use: Lather soap and apply to wet face. Rinse and pat dry. Apply cream to face after washing or anytime face needs moisturizing. Apply under-eye serum at bedtime. Ingredient Label: SOAP: Sorbitol, Coconut Oil, Propylene Glycol, Stearic Acid, Water, Sodium Hydroxide, Glycerin, Honey, Fragrance. CREAM: Soy Butter, Tapioca Starch, Fragrance, Meadowfoam Seed Oil, Sweet Almond Oil, Apricot Kernel Oil, Vitamin E, Castor Oil. SERUM: Castor Oil, Meadowfoam Seed Oil, Sweet Almond Oil, Apricot Kernel Oil, Vitamin E, Fragrance. "Is the face cream supposed to feel gritty and greasy? I made this recipe and I’m testing it before I sell it. My lotion feel greasy and gritty when I apply it"
Staff Answer There is nothing in the recipe that should give it a gritty feel so we are not sure why you are feeling this. The recipe is all butter and oils so it is a more greasy product. The Slick Fix was added to this recipe to help take away that greasy feel. You could add more of this ingredient if you like. "For the eye serum, can the meadowfoam seed oil be substituted with Jojoba oil? What would be a good substitute for the castor oil?" Staff Answer We would recommend any substitutions for the oils be replaced with ones that absorb quickly and do not leave a greasy feel. "What other butter or butter combinations can you use other than soy butter?" Staff Answer You can substitute any of our Crafters Choice butter blends in this recipe. They all have a softer consistency and will work well.